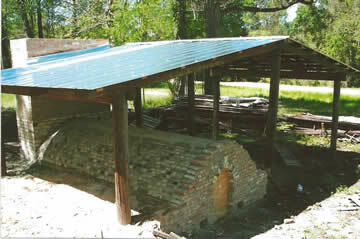 The Crawford County Historical Society sponsored construction of this replicate historic woodfired “groundhog” pottery kiln starting in 2005 with most of the effort occurring in 2006 and early 2007. The first firing of pottery was on May 18, 2007 during the Jugfest/Old Knoxville Days festival centered at the 1852 Historic Crawford County Courthouse in Knoxville Georgia. The Historical Society had three objectives in mind when they formed a loose-knit partnership with Shelby West to create the kiln. First, the kiln demonstrates a critical part of life in the 1800s and early 1900s in Crawford County – the making of utilitarian pottery for everyday use and for sale. Pottery was an important part of the local economy with "jugmakers" supplying stores, breweries and hospitals throughout the state. Additionally, the kiln provides educational opportunities to the local community and visitors in art, crafts, geology, migration patterns, and historic daily life styles. Second, the kiln provides a method for promoting Crawford County's contributions to the state's growth and economy and to development of the pottery craft. As a focal point for visitors, it promotes heritage tourism. It will support exhibits, pottery classes and other events in the Cultural Center that eventually will be a part of the historic 1852 Crawford County Courthouse which is “just up the road” approximately 200 yards from the kiln. Third, sale of pottery from the kiln financially benefits area potters, thereby helping to revive the pottery tradition, and Historical Society projects such as the Cultural Center and Historic Courthouse. While the Historical Society was the focal point for construction of the kiln, many people from the community and many supporters from around the state were also involved. Local landowner Bryant Pyles allowed use of his land for the project. He and several members of his family, who are descendants of early potters, contributed funds, materials and labor. Local potter Shelby West conceived, planned and provided a great part of the labor for this project. Local potters Charlie B. West and Mark Merritt were also involved as were collectors from Texas, researchers from Alabama, and many citizens and pottery enthusiasts from Crawford County. Owners of the former Merritt Pottery, a local bricklayer, and a pottery lover from South Georgia donated bricks. 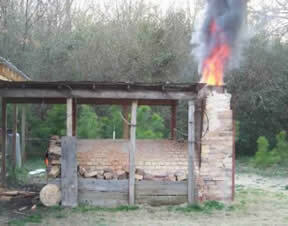 Two local businessmen purchased two loads of special fire brick and brought them from Athens, Georgia to Crawford County at their own expense. Another provided the trailer and yet another loaned a brick saw. Both the Crawford County Commission and the Roberta-Crawford County Chamber of Commerce supported the construction and use of the kiln. Area newspapers and television stations have covered various events to help publicize the project. Shelby West was uniquely qualified to lead the kiln project. He first became interested in pottery in his high school art class where his pieces were fired in an electric kiln. While attending Barry College he assisted with art classes during the summer and began to read more about Crawford County potters, their history, and their techniques. This led him to a commitment to learn to create pottery using historic techniques and materials. Using photographs in a book he built a potter’s kick wheel from salvaged oak wood. He learned where to dig his clay and then ground it in his homemade mill. He then learned to duplicate the historic alkaline glazes which he uses for all his pieces. His first “groundhog” kiln was a small one at his parent’s Crawford County home so he could be certain his kiln design and technique would work satisfactorily. Then he constructed a large version (shown in the photograph) at his home in Adairsville, Georgia. From there he has amassed a large body of work, all produced with historic techniques and materials. Mark R. Merritt was another valuable participant in the kiln construction. He is a 6th generation Merritt/Crawford County potter. Mark considers himself a modern Crawford County potter in that he produces pieces of traditional style using modern glazes and techniques. Mark and his family also manufacture clay for use in pottery at Lizella Clay Company, a business founded by his father, Ray, more than forty years ago. Mark is descended from a long line of Crawford County potters. He is a grandson of the late Jewel Merritt, a great-great grandson of the late Jackson (Jack) Merritt, and a great-great-nephew of William (Billy) Merritt, all well known potters. Shelby’s father, Charlie B. West, also made major contributions to the construction and operation of the kiln. He became interested in pottery “throwing” as he and his wife, Marcia, encouraged and supported Shelby as he was developing his historic and traditional techniques and processes. Since then, under Shelby’s tutelage, he has become a proficient potter in his own right. Charlie and Shelby together haul in the wood to feed the kiln fire, load the pieces into the “ware-bed,” along with volunteers tend the fire for approximately ten to twelve hours, and finally remove the cured pieces for final cooling and display. He teaches, along with Shelby and Mark Merritt, at the one-session pottery classes the Historic Society offers to elementary and high school art pupils and adults as part of the Jugfest elebration so we can further our pottery traditions. Charlie has in his personal pottery collection a signed and dated piece from every firing of the Knoxville Bottom kiln. of the entrance. This makes it much easier to tend the fire during inclement weather and provides additional space to protect fire wood from the weather. 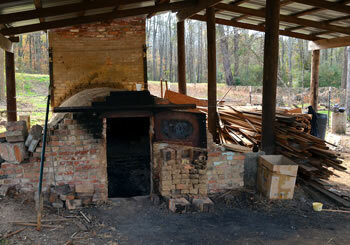 In 2013 the Historical Society allocated $1500 for materials for Shelby West to renovate the kiln’s chimney. This type of kiln requires continuous repairs and up-grades because of the damage resulting from the intense heat generated during a firing. Since the kiln became operational in 2007 it has been fired about four times a year, one of the four as part of the Jugfest/Old Knoxville Days festival. For each firing potters from throughout the state and elsewhere are invited to bring their wares, and an average of five potters usually participate. They come from around Georgia and surrounding states. Pieces are fired for local high school students learning about pottery in their art class. Middle school students visit the kiln during firings on field trips. A young potter from Demorest in North Georgia recently became interested in pottery and the woodfired method and has taken part in two firings. Other potters participate in order to see the results of their efforts completed in a historically accurate process. Each time the kiln is fired generally 10 to 20 visitors help stack wood, feed the fire, provide hot chocolate and coffee, and offer moral support. The ten-to-twelve hour process gives the potters opportunities to discuss methods and history and to educate visitors. For the glazes being used a temperature of 2350 degrees to 2400 degrees is maintained in the kiln by adjusting the size of the fire and the amount of air flowing across the pieces. Kiln temperature is determined with a series of “temperature equivalent” pyrometric cones each of which deform or melt at a specified temperature. The number of pieces in a particular firing, their relative sizes and masses, and the potter’s experience with this type of kiln govern the arrangement of the pieces within the kiln so that the glaze is vitrified (melted) and the pieces don’t crack. Having the glaze vitrified means the container will not leak when filled with liquids and they can be used in an oven or microwave. The firing duration for a particular kiln load depends on, for example, the moisture content of the atmosphere or if there are air leaks around some bricks (from a previous firing) affecting how long it takes to achieve the desired temperature. Most of the firings are followed (after a cooling period) by a round-robin sale. Participating potters price their goods. One at a time buyers select one piece in the order in which they register for the sale. When all buyers have made their selections, the process is repeated until there are no more pieces or no more buyers. The Historical Society collects a buyer's premium and manages the sale process. like an upturned boat in the interior to support the firebricks of the roof until the full structure is complete and self-supporting. Once the top brickwork is complete, the wooden frame is removed.